Well we're finally back home. Surreal? Yes. The weirdest thing is that our lush greenery has been a bit burnt, at least giving way to a WAY bigger view (looking for a positive here!). BUT the green has already started to come back which is awesome. The "now" view from the apartment we stay when you stay in Villa Capri. Bonus? We now have an ocean view. We stopped by The Vix restaurant to grab some lunch and visit our amazing friends there, it's open for business as are a bunch of places. Shops are getting back on their feet and people here are working hard to get back to normalcy, because that's what we all want. We stuffed a few bags with tarps, shirts, bug spray, baby wipes, toothbrushes, toothpaste and a host of other items to drop off here. 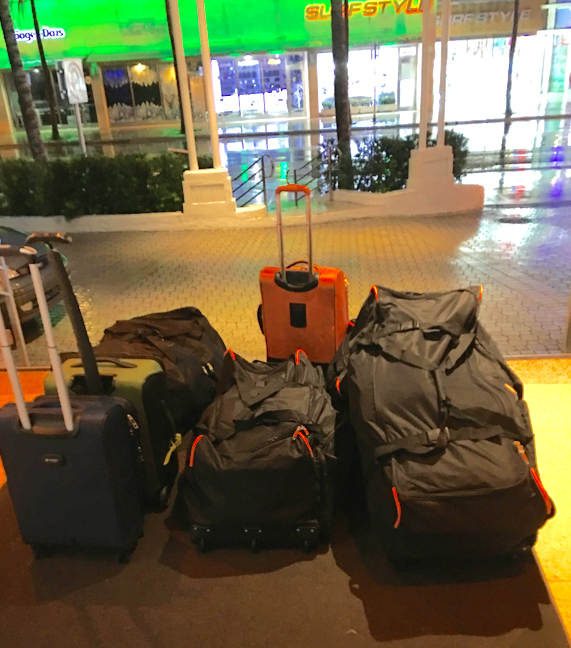 for those of you who know us well, you know that we are light packers and for the past month we have been living out of the green bag and the orange bag, so for us this was a BIG DEAL! LOL. Love the Sagamore Hotel, except for the fact that the doormen didn't help us with these ONE BIT! 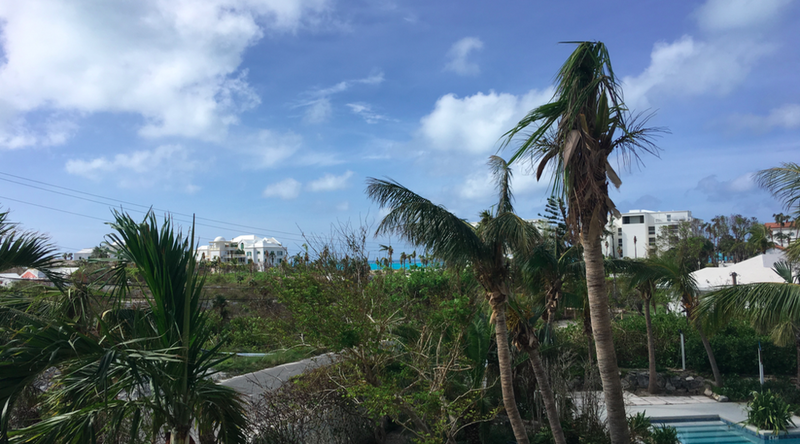 Supplies will likely get distributed to Salt Cay and Grand Turk, who were hit pretty hard. They're a bit off the beaten path so sometimes they feel (and probably are) 'forgotten'. So we'll be headed over to the Villa in a few minutes to see what's up, but with the help of friends we're sure it's in good condition. P.S. John just got off the horn with Florida Lumber where he put the order in of 500 sheets of plywood. This comes from our GoFundMe page where we almost hit our goal of $25,000. We are going to have to increase that! Again a huge thank you if you've donated, we're focusing on "rebuilding" for our fund and roofs are a very important part of that. If you haven't donated we're always accepting donations so go on with your bad self, give a little!